Two men have been sentenced for murdering a jeweller who was kidnapped and killed in a botched robbery. Ramniklal Jogiya, 74, was bundled into a van and tortured in a plot to steal almost £200,000 of gold jewellery. Thomas Jervis, 24, and Charles Mcauley, 20, were convicted of murder and given life sentences with minimum terms of 33 and 30 years respectively after being found guilty of his murder. Callan Reeve, 20, was convicted of manslaughter and jailed for 16 years. The trio's trial at Birmingham Crown Court heard Mr Jogiya was bundled into a van while walking home in January after locking up his shop. Jervis went back to the shop to open the safe while wearing a burka disguise and pushing a shopping trolley to carry the jewellery, but was defeated by a 12-hour time-lock. Mr Jogiya was probably still alive when the men dumped him from the van on Gaulby Lane, an isolated location near Leicester Airport, the jury heard. He could not call anyone for help as the gang had thrown away his phone. Mr Jogiya was beaten to the head, causing a bleed on the brain and traumatic brain injury during the kidnapping. The grandfather was handled with such force that one of his biceps was ripped away from the bone, six of his ribs on the left side were broken and he had multiple injuries to his hands and fingers. The judge said he had been severely beaten, with evidence of being shot with a BB gun, shackled with cable ties and cut with a knife, before being dumped. 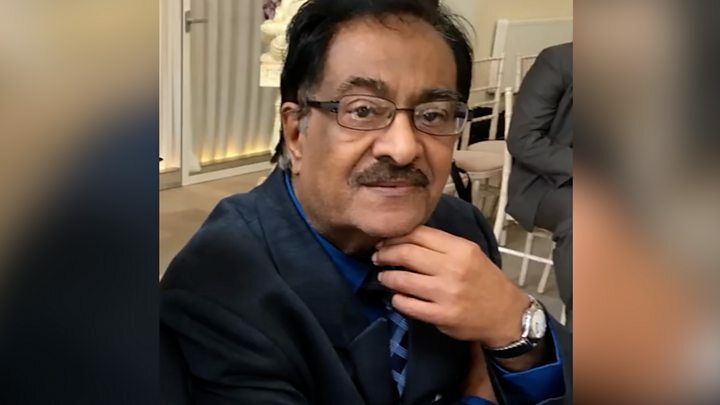 In a statement, Mr Jogiya's family said the jeweller had been "cruelly taken away from us while he was all alone and helpless". They added: "Our father did not deserve this to happen to him and we wouldn't wish it on anyone else. These people did it for money - money they did not get at the end. "This exposure to pure aggression and hate has changed forever how we live in our town, where we are part of the community." Police described the six-month investigation into the death of Mr Jogiya as "extremely intense". It involved more than 2,000 lines of enquiry and 600 statements, with 2,400 exhibits gathered. It was worked on by more than 200 staff from across five different forces. Mcauley and Jervis hugged as they walked from the dock, and Mcauley nodded and waved to family in the packed public gallery. Reeve bowed his head as he was sentenced. Jervis, of Enderby Road in Whetstone; Mcauley, of Gooding Avenue, Leicester; and Reeve, of Aylmer Road, Leicester; all admitted kidnapping and robbery and were sentenced to 12 years for those offences, to be served concurrently. Reeve was found not guilty of murder but convicted of manslaughter after the five-week trial.